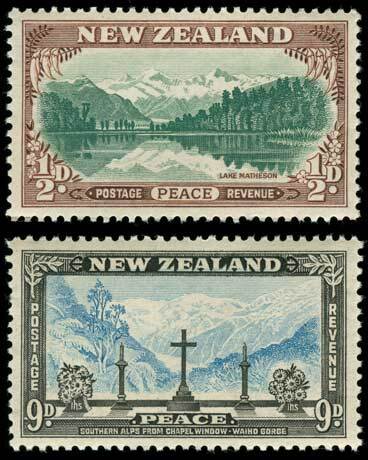 When a set of stamps were issued in 1946 to mark the end of the Second World War, they included two scenes from South Westland. The upper view shows reflections of Mt Tasman and Aoraki/Mt Cook in the waters of Lake Matheson, a glacial lake near Fox Glacier. It is possible to photograph the same scene today on clear, windless days. The lower picture shows Franz Josef Glacier, seen from the window in St James Church at Franz Josef.